75 mm/63 Mle 190820 х 1 pcs. Initial HE Shell Velocity930 m./s. 100 mm/45 Mle 189220 х 1 pcs. Initial HE Shell Velocity740 m./s. Turenne — French Tier III battleship. 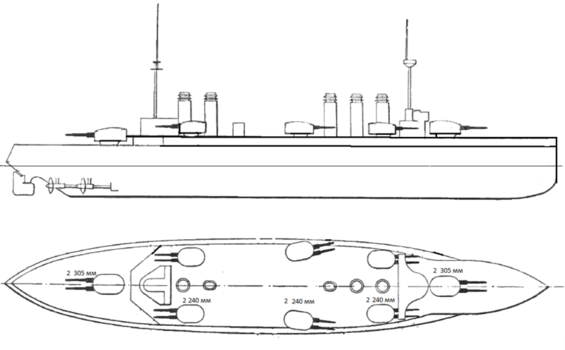 A version of the first French battleship design that adopted unified main battery guns. It was the development of the last French battleship-dreadnoughts that featured a characteristic and recognizable profile and diamond-shaped arrangement of guns. Turenne plays and handles very similarly to her Tier III contemporaries, Nassau and Kawachi. Like most other low tier battleships, Turenne travels at a slow pace, requiring captains to plan their moves ahead of time. Additionally, the ship boasts a thick main and upper armor belt that can easily protect against enemy fire with the proper angle. Like Nassau and Kawachi, Turenne carries her primary guns in a hexagonal arrangement. While this prevents all guns from being fired simultaneously, it allows for captains to maintain firepower on both sides of the ship. The wide firing angles of the rear turrets allow captains to make use of a majority of the ship’s firepower while keeping a narrow profile towards the enemy. However, captains should make note of their shell and target selection prior to firing. Turenne’s armor piercing shells have a low initial velocity and often struggle to deal effective damage against distant ships. Instead, captains may find high explosive shells to be more effective, especially at heavily angled or far-away targets. While Turenne's armor is not the thickest at her tier, it can protect the ship’s citadel from enemy fire, given the proper angle. The extended main belt and large upper belt also limit the areas on the ship that are vulnerable to enemy high explosive shells. 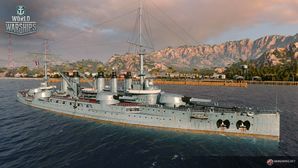 Captains should make use of the ship’s armor, wide firing angles, and small turning circle to quickly fire before angling the ship against returning shells. In short, Turenne is very similar to other Tier III battleships in numerous ways. Like other dreadnoughts, she trades speed for better armor and bigger guns. However, captains may often find themselves switching shell types or targets due to the low penetration of the armor piercing shells. The ship's citadel is located below the waterline and is well protected by the armor belt. The side mounted turrets have wide firing angles, allowing for the majority of the ship's firepower to be used while maintaining a narrow profile. Small turning circle allows the ship to quickly maneuver away from torpedoes or enemy fire. Armor piercing shells have a slow initial velocity and often struggle to damage battleships or cruisers at a distance. Slow turret traverse prevents captains from firing their guns while turning. Carries few anti-aircraft guns, leaving the ship vulnerable to carrier strikes. Hull: Upgrade to Hull (B) for an improved rudder shift time and additional hit points. Research of this module unlocks progression to Courbet. Gun Fire Control System: Upgrade to PCA n° 3 Mle 2 for an extra 10% range on the main battery. Propulsion: Upgrade to the 26,000 hp engine to increase the ship's top speed by 1.2 knots. Captains should first research Hull (B) before researching the Gun Fire Control System and Propulsion upgrades. Slot 1 provides several options for captains. Main Armaments Modification 1 is recommended to provide additional survivability to the main battery, but players who desire to specialize in the secondary armament should choose Auxiliary Armaments Modification 1. Key skills for Turenne commanders include Expert Marksman at Level 2, Superintendent at Level 3, and Fire Prevention at Level 4. Basics of Survivability can also be taken to reduce the time required to extinguish fires. Concealment Expert is also recommended to reduce the ship's detection range. Premium versions of these consumables are recommended to decrease their cooldown timers. Turenne captains should mount signal flags that improve the ship's survivability. November Foxtrot ( ) and India Delta ( ) flags can be mounted to improve the effectiveness of the ship's consumables. India Yankee ( ) flags are recommended to reduce the time needed to extinguish fires. Captains may also find Sierra Mike ( ) flags useful to increase the ship's top speed. Lastly, economic and special signal flags can be taken to improve the ship's economic gains per battle. Turenne is a fictionalized version of the Danton semi-dreadnought. She carries six turrets instead of eight and all of them are 305mm calibre. The sketch shown above is actually Danton and not Wargaming's interpretation. The six 240mm secondary battery turrets clearly indicated are not present on Turenne. Turenne is actually the name of a Bayard-class ironclad warship that was built in 1879 and stricken in 1901. No other ship in the French Navy has inherited the name since. This page was last modified on 13 March 2018, at 15:50.